Want to give some American Express Gift Cards as gifts this holiday season? Use this 100% off American Express gift card purchase fee code to save some money when ordering your gift from now till December 31th. We bought a few AMEX gift cards last years as holiday gifts for the kids’ school teachers. The cards looked very nice and their teachers really liked them. So this year, we plan to buy a few more for Christmas and New Year because AMEX gift cards have no expiration date and don’t lose value. If a card is lost or stolen, the remaining balance can be refunded or replaced, making them perfect gifts for all occasions. If you are also considering buying some AMEX gift cards for the coming Father’s Day or if you have friends or family members who are graduating this summer, you can use the fee free code that American Express sent to me to save on gift card processing charge. Usually the processing fee is $3.95 regardless the value of the card, and the same fee applies to each card. Therefore, if you plan to buy cards for more than one people, using the fee free code can save quite some money, especially for cards with small value. 3. Continue to check out and you will see that the code you just entered has been accepted and your purchase charge will be waived. 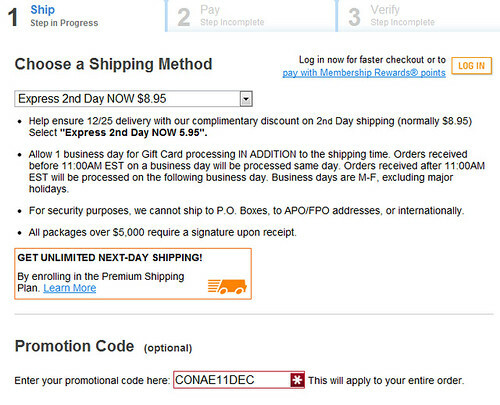 As you can see from the above screenshot, the cost is $8.95 for 2nd Day Express shipping. Remember this promo code only works when you check out your purchase with an AMEX credit card. If you have an AMEX credit card and an account online that allows you to access your card information, you can log into your account and can use an AMEX card to pay for your purchase; or you can even use Rewards Points earned from AMEX cards. Payment made with other credit card brands will not save you the purchase fee. Cool! Thanks for the tip – I hate when it costs extra to buy gift cards. FYI there are no processing charges if you buy an email gift card at eBillme.com, and there are some sweet holiday deals going on right now – you can get a $100 JCPenney e-Gift Card for $90 with an instant rebate, and you can save $15 with other gift card purchases!